I simply love this season. The weather is cooler, the wind feels great against your skin, and it’s prime time for bonfires and s’mores. Plus, it’s pumpkin season… Or more accurately, pumpkin patch season. When you’ve got a family, this is a big deal. Our annual trip to the pumpkin patch has been a treasured tradition. There are so many things to take in at the pumpkin patch. You can browse for your perfect pumpkin, you can watch the children play, or you can engage in the activities. Personally, I simply enjoy sipping a cup of coffee and taking in the smells of hay, fallen leaves, and rain from the night before. Throughout the years, we’ve been to many pumpkin patches in Orange County. There are so many great spots to spend your fall season. Luckily, our favorites are all, right here, in Irvine! 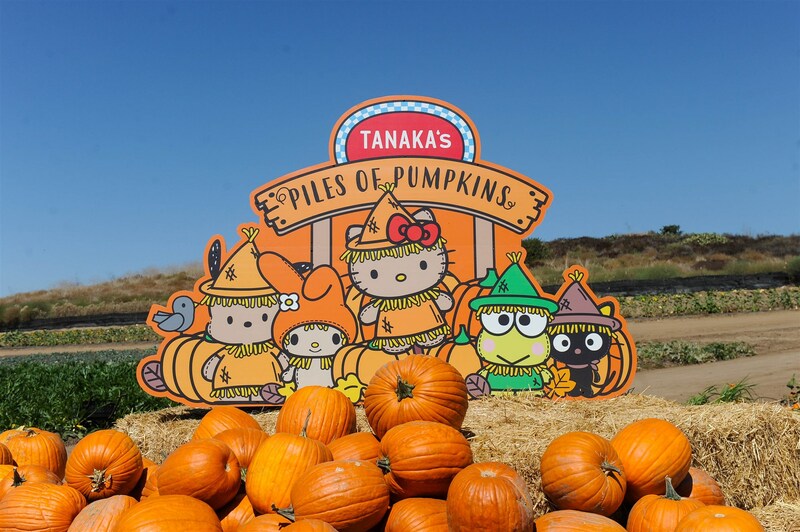 If you want a unique experience, go to the Tanaka Farms pumpkin patch TODAY! They’ve got an incredible amount of activities available. You get access to a continuous wagon ride, petting zoo, corn maze, sunflower field, and U-Pick vegetable patch, acres of pumpkins, their “Market Stand” and even a PUMPKIN CANNON. I think the petting zoo is great. In Orange County, sometimes you long for that rural, farm-style feeling. At the Tanaka Farms petting zoo, they deliver it. I mean, how often do you get to pet a goat and feed chickens in Irvine? Never, if you’re missing out on the Tanaka Farms Pumpkin Patch! Our family also thinks that Tanaka Farms is the most “instagrammable” pumpkin patch we’ve been too. Partly, at least, that’s because they have a partnership with Hello Kitty. You can find Hello-Kitty themed signs, decorations, booths, and even merchandise all over. Tanaka Farms is owned by a Japanese-American family, which helps make sense of the otherwise strange association. If you end up going, make sure you take a picture and let us know how it went! This option is everything you'd expect in a classic American Pumpkin Patch. The floor is lined with hay, pumpkins are scattered across the premises, and scarecrows stand guard all around. There are quite a few kid-friendly activities available as well. Whereas Tanaka Farms is the Japanese-American fusion, Johnson Brothers is the All American classic. Some of their most popular attractions are pumpkin carving, face painting, bounce houses, and their ‘Native American Village’. My favorite thing about Johnson Brothers is that it’s not an expensive experience. Unlike most large pumpkin patches, Johnson Brothers does not charge for parking or admission! Plus, many of the activities are free as well! Their ‘Native American Village’ is entirely free, and they encourage you to take advantage of their free self face-painting stations! I wanted to include an option for those who don’t enjoy the hustle and bustle of crowds at popular pumpkin patches. Not everyone likes big crowds and loud scenery. Sometimes we just want to relax with our loved ones and enjoy each other's company… and that’s why the Great Park Pumpkin Workshops are great. The next one is on Saturday, October 20th, at 10:00 AM. It’s a much smaller scale operation than the two other options. In fact, it’s actually more of a class than a full-scale pumpkin patch. However, I enjoy these just as much. It’s the perfect opportunity to grab that cup of joe and take in the scenery. The workshops are entirely free. Just show up, and you get to create your own pumpkin centerpiece or carving. Not only that, but the Great Park is decorated for the season. 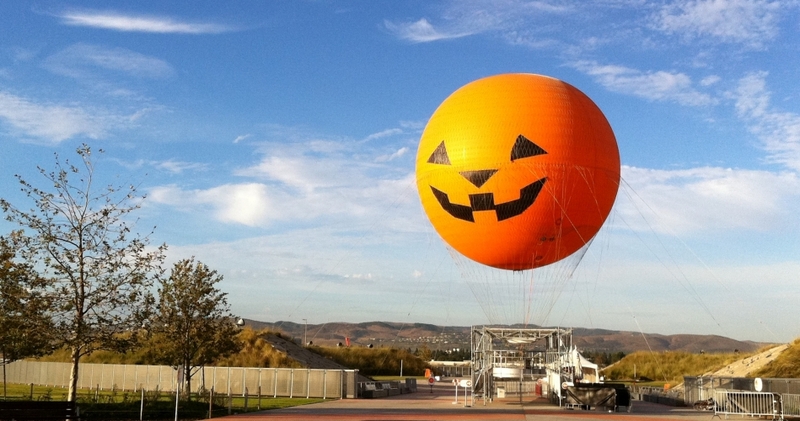 They’ve even turned the Orange hot air balloon into a jack-O-lantern. How cool is that? The “University of California Master Gardeners of Orange County” conduct the class. Their instructors teach you how to properly cut, decorate and arrange pumpkins. When you’re all done, you end up with your own unique centerpieces that can be displayed for the autumn season, at home. 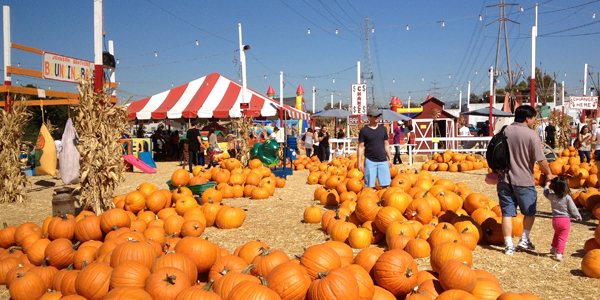 We believe these pumpkin patch experiences are the three best options for Orange County residents. There's a range of options from big and bustling, to quiet and tranquil. However, all of them are incredible adventures for the fall season. Don't miss out - attend one of these soon! And, when you do, let us know which one you attended! We're always excited to hear from our readers. Go and carve out some fun this week!